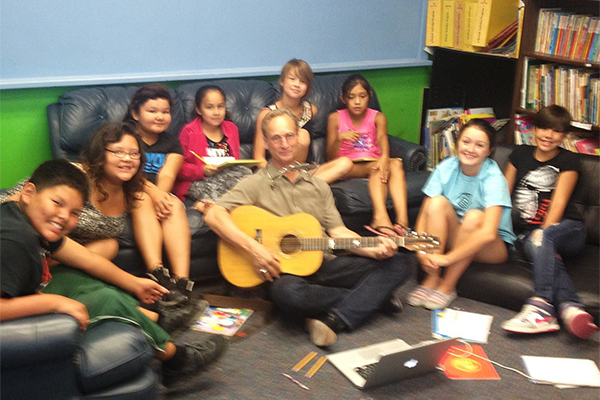 In 2014, Larry partnered with the Leech Lake Boys & Girls Club in Cass Lake, MN to write and perform a community song with local young people. Larry Long is an American singer-songwriter who has made his life work the celebration of everyday heroes. Author, historian, actor, and broadcaster Studs Terkel called Larry “a true American Troubadour.” Larry has written and performed hundreds of ballads celebrating community and history makers. His work has taken him from rural Alabama to the Lakota communities in South Dakota as he has given musical voice to struggling Midwest farmers, embattled workers, veterans and marginalized communities. He assembled the first hometown tribute to Woody Guthrie in Okemah, Oklahoma, which today has evolved into the annual Woody Guthrie Folk Festival. Long has sung at major concerts and festivals throughout the United States and world, including Awesome Africa Festival in South Africa, Winnipeg Folk Festival, at the Hollywood Bowl with Kris Kristofferson, and at Madison Square Garden with Joan Baez and others for Pete Seeger’s 90th Birthday Celebration. Long’s work in schools and communities sparked the creation of a non-profit organization, Community Celebration of Place, which creates intergenerational and multicultural opportunities for students to learn and grow through a program called Elders’ Wisdom, Children’s Song. Long is a recipient of the prestigious Bush Artists Fellowship, the Pope John XXIII Award, Sustainability Award, and “In The Spirit of Crazy Horse Award” for his work in forgotten communities. Leading up to his concert at the St. Mane Theatre with the American Roots Revue on May 17, Larry will use his songwriting curriculum to assist Lanesboro community members in sharing their stories and turning that collective narrative into a song as part of the Performing Artist Engagement Program. This song will be presented at both “Over the Back Fence” on May 10 and the American Roots Revue concert on May 17, with community members participating. This is an art experience, but more a celebration of the special circumstance of Lanesboro and an educational device to develop empathy across the community from one group to another. This activity is made possible by the voters of Minnesota through an Arts Tour grant from the Minnesota State Arts Board, thanks to a legislative appropriation from the Arts & Cultural Heritage Fund. Larry will be in Lanesboro on Wednesday, May 8 to get acclimated, collect stories informally and meet with several community groups and residents. On Thursday, May 9, Larry will give a mini-performance at Kenilworth Apartments, following SEMCAC Senior Dining. Learn more about SEMCAC Senior Dining. Larry will lead a public Music & Storytelling Circle at the High Court Loft on Thursday, May 9 at 6:30 p.m. The regular Open Mic at High Court Pub is taking place on Thursday, May 9 following the workshop and Larry is planning to share some music and stories there. Learn more about High Court Pub. The “Over the Back Fence” Variety Show will feature Larry as a musical guest, and Larry will perform alongside community members in the show. Those interested in participating can attend rehearsals on Tuesday, May 7 at 7 p.m. and Friday, May 10 at 5:30 p.m. at the St. Mane Theatre. The variety show will take place Friday, May 10 at 7:30 p.m. at the St. Mane Theatre. Learn more about Over the Back Fence. On Friday, May 17, Larry will present a capstone concert, as part of an eight piece gospel, roots and soul band, in the intimate environment of the St. Mane Theatre at 7:30 p.m. Learn more. This activity is made possible by the voters of Minnesota through an Arts Tour grant from the Minnesota State Arts Board, thanks to a legislative appropriation from the Arts & Cultural Heritage Fund.